2007-08-16 First worldwide family litigation filed litigation Critical https://patents.darts-ip.com/?family=34217089&utm_source=google_patent&utm_medium=platform_link&utm_campaign=public_patent_search&patent=CN102772380(B) "Global patent litigation dataset” by Darts-ip is licensed under a Creative Commons Attribution 4.0 International License. 公开了对于HIV蛋白酶抑制剂可提供改善的口服生物利用度的固体药物剂型。 Discloses a solid pharmaceutical dosage form for the HIV protease inhibitor can provide improved oral bioavailability. 具体而言，该剂型包含至少一种HIV蛋白酶抑制剂和至少一种可药用水溶性聚合物和至少一种可药用表面活性剂的固体分散体，所述可药用水溶性聚合物具有至少约50℃的Tg。 Specifically, the dosage form comprises at least one HIV protease inhibitor and at least one pharmaceutically acceptable water-soluble polymer water-soluble polymer and at least one pharmaceutically acceptable surfactant solid dispersion, having said pharmaceutically acceptable Tg of at least about 50 deg.] C. 优选地，可药用表面活性剂具有约4至约10的HLB值。 Preferably, the pharmaceutically acceptable surfactant has an HLB value of from about 4 to about 10. 本申请是申请号为"200480024748. X"，发明名称为"固体药物剂型"的发明专利申请的分案申请。  The present application is a divisional application of application number "200480024748. X", entitled "solid pharmaceutical dosage form" patent application of the invention. 本申请涉及包含至少一种HIV蛋白酶抑制剂的固体药物剂型，及其制备方法。  The present application relates to at least one HIV protease inhibitor in the solid pharmaceutical dosage form comprising a preparation method thereof. 引起获得性免疫缺乏综合征（AIDS)的病毒是已知的，其具有多个名称，包括T-淋巴细胞病毒III (HTLV-III)或淋巴结病相关病毒（LAV)或AIDS-相关病毒（ARV)或人类免疫缺陷病毒（HIV)。  cause acquired immune deficiency syndrome (AIDS) virus is known, having a plurality of names, including T- lymphotropic virus III (HTLV-III) or lymphadenopathy associated virus (LAV) or AIDS- related virus (ARV) or human immunodeficiency virus (HIV). 截至到目前，已经确认了两个不同的家族，即HIV-I和HIV-2。 Up to now, it has been confirmed that two distinct families, namely HIV-I and HIV-2. 反转录病毒的生命周期中重要的通路之一是通过天冬氨酸蛋白酶的多蛋白前体的加工。  One of the important passage retroviral life cycle is the processing of the polyprotein by aspartic proteases body. 例如在HIV病毒中，gag-pol蛋白被HIV蛋白酶加工。 For example, in HIV virus, gag-pol protein by HIV protease processing. 天冬氨酸蛋白酶对前体多蛋白的正确加工方法需要组装感染性病毒颗粒，因此使天冬氨酸蛋白酶成为抗病毒治疗的有吸引力靶标。 Aspartic protease precursor polyprotein proper working method requires assembly of infectious viral particles, thus making the aspartic protease for antiviral therapy an attractive target. 尤其是对HIV的治疗，HIV蛋白酶是有吸引力的靶标。 Especially for the treatment of HIV, HIV protease is an attractive target. 药物的口服剂型的可能有效性的一个量度是剂型口服后观测到的生物利用度。  may be a measure of the effectiveness of the oral dosage form is a pharmaceutical dosage form observed after oral bioavailability. 当口服施用时，多种因素可影响药物的生物利用度。 When orally administered, a number of factors can affect the bioavailability of the drug. 这些因素包括水溶性、通过胃肠道的药物吸收、剂量强度和首过效应。 These factors include aqueous solubility, the drug through the gastrointestinal tract absorption, dosage strength and first pass effect. 水溶性是这些因素中最重要的因素之一。 Water-soluble is one of these factors the most important factor. 遗憾的是，HIV蛋白酶抑制化合物一般都具有水溶性差的特点。 Unfortunately, HIV protease inhibiting compounds typically have poor water solubility characteristics. 出于多种原因，例如患者依从性和掩蔽味道，固体剂型通常优于液体剂型。  For various reasons, such as patient compliance and taste masking, a solid dosage form generally preferred over a liquid dosage form. 然而在大多数实例中，药物的口服固体剂型比药物的口服溶液提供更低的生物利用度。 In most instances however, oral solid pharmaceutical dosage forms to provide a lower bioavailability than oral solutions of the drug. 已经尝试通过形成药物的固溶体来改善固体剂型所提供的生物利用度。  Attempts have been made to improve the bioavailability provided by solid dosage forms by forming solid solutions of the drug. 术语"固溶体"定义为药物以分子型分散于基质中各处的固态系统，这样该系统在物理和化学上各处一致或均匀。 Definitions The term "solid solution" type of drug molecularly dispersed in the solid matrix throughout the system, so that the uniform or consistent throughout the system physically and chemically. 固溶体是优选的物理系统，因为当与液体介质例如胃液接触时，其中的各组分易于形成液体溶液。 Solid solutions are preferred physical systems because when, for example gastric fluid in contact with a liquid medium, wherein the components easily form a liquid solution. 易于溶解可至少部分借助于下述事实：来自固溶体的组分的溶解所需要的能量低于来自晶体或微晶固相的组分的溶解所需要的能量。 Readily soluble at least in part by means of the fact that: the energy required for dissolution of the components from a solid solution is lower than the energy of dissolved components from a crystalline or microcrystalline solid phase required. 然而，如果药物在胃肠道中吸收较慢，从固溶体中释放的药物可导致在胃肠道的水流体中形成高度过饱和和沉淀。 If, however, the drug absorption in the gastrointestinal tract slowly released from the solid solution may result in formation of a highly drug supersaturation and precipitate in the aqueous fluids of the gastrointestinal tract. 存在研制用于HIV蛋白酶抑制剂的改善的口服固体剂型的持续的需要，该固体剂型应具有适宜的口服生物利用度和稳定性，并且不需要高载体容积。  The present development is a continuing need for improved oral solid dosage forms of HIV protease inhibitors, the solid dosage form should have a suitable oral bioavailability and stability, and does not require a high capacity carrier. 本发明提供了一种固体药物剂型，其包括至少一种HIV蛋白酶抑制剂在至少一种可药用水溶性聚合物和至少一种可药用表面活性剂中的固体分散体。  The present invention provides a solid pharmaceutical dosage form, comprising at least one HIV protease inhibitor, at least one pharmaceutically acceptable water soluble polymer and at least one pharmaceutically acceptable surface active agent in the solid dispersion. 在一个实施方案中， 可药用水溶性聚合物的玻璃转化温度（Tg)为至少约50°C。 In one embodiment, the pharmaceutically acceptable water-soluble polymer glass transition temperature (Tg) of at least about 50 ° C.
 术语"固体分散体"定义为包含至少两种组分的固态（相对于液态和气态）体系， 其中一种组分均匀的分散于另外一种或多种组分中。  The term "a solid dispersion" defines a solid state comprising at least two components (with respect to liquid and vapor) system, wherein one component is dispersed uniformly in one or more additional components. 例如，活性成分或活性成分的组合分散于包含可药用水溶性聚合物和可药用表面活性剂的基质中。 For example, a combination of the active ingredient or active ingredient dispersed in a pharmaceutically acceptable water soluble polymer comprising a matrix and a pharmaceutically acceptable surface active agent. 术语"固体分散体"包括一个相分散于另一个相中的具有小颗粒的系统，颗粒的直径一般小于lym。 The term "solid dispersion" encompasses systems having one phase dispersed in another phase of small particles, the particle diameter is generally less than lym. 当组分的所述分散体是各处化学和物理上一致或均匀的或由一个相组成（如热力学所定义）的系统时，这样的固体分散体称作"固溶体"或"玻璃态溶液"。 When said dispersion of the components is chemically and physically uniform throughout or consists of a homogeneous system or a phase (as defined in thermodynamics), so that a solid dispersion called a "solid solution" or a "glassy solution" . 玻璃态溶液是均匀的玻璃态系统，其中溶质溶于玻璃态溶剂中。 Glassy solution is a homogeneous, glassy system in which a solute is dissolved in a glassy solvent. HIV蛋白酶抑制剂的玻璃态溶液和固溶体是优选的物理系统。 HIV protease inhibitor solution glassy solid solution are preferred physical systems. 这些系统不包含任何大量的晶体态或微晶体态的活性成分，其通过热分析（DSC)或X-射线衍射分析（WAXS)证实。 These systems do not contain any large amount of crystal form or microcrystalline active ingredients body, by thermal analysis (DSC) or X- ray diffraction analysis (WAXS) was confirmed. 在本发明的一个实施方案中，药物剂型包含占剂型总重量约5至约30% (优选占剂型总重量约10至约25% )的HIV蛋白酶抑制剂或HIV蛋白酶抑制剂的组合、占剂型总重量约50至约85% (优选占剂型总重量约60至约80% )的水溶性聚合物（或这些聚合物的任意组合）、占剂型总重量约2至约20% (优选占剂型总重量约3至约15% )的表面活性剂（或表面活性剂的组合）和占剂型总重量约0至约15%的添加剂。  In one embodiment of the invention, the pharmaceutical dosage form comprises a combination of the total weight of the dosage form from about 5 to about 30% (preferably from about 10 to about 25% by weight of the total dosage form) of an HIV protease inhibitor or HIV protease inhibitor , the total weight of the dosage form from about 50 to about 85% (preferably from about 60 to about 80% by weight of the total dosage form) of a water-soluble polymer (or any combination of such polymers), the total weight of the dosage form from about 2 to about 20% ( preferably about 3 to about 15% by weight of the total dosage form) of the surfactant (or combination of surfactants), and from about 0 to about 15% by weight of the total dosage form of additives. BMS186, 318 ;SC-55389a ;BILA1096BS ;和U-140690 或它们的组合。  BMS186, 318; SC-55389a; BILA1096BS; and U-140690, or combinations thereof. 在一个实施方案中，利托那韦（Abbott Laboratories，Abbott Park，IL，USA)是一种可配制成本发明剂型的HIV蛋白酶抑制剂。  In one embodiment, ritonavir (Abbott Laboratories, Abbott Park, IL, USA) is formulated into dosage forms of the invention an HIV protease inhibitors. 该化合物和其它化合物以及它们的制备方法公开于美国专利5, 542, 206和5, 648, 497中，将其公开的内容在此引入作为参考。 This and other compounds and their preparation are disclosed in U.S. Patent No. 5, 542, 206 and 5, 648, 497, the disclosure of which is hereby incorporated by reference. 在另一个实施方案中，本发明提供一种其中所述HIV蛋白酶抑制剂是利托那韦或利托那韦与至少一种其它HIV抑制剂的组合的剂型，所述剂型在狗中显示的利托那韦血浆浓度的剂量调节的AUC为至少约9 μ g. h/ml/100mg。 In another embodiment, the present invention provides a method wherein the HIV protease inhibitor is ritonavir or ritonavir at least one combination with other HIV inhibitors dosage form displayed in dogs ritonavir dose adjusted AUC of plasma concentration of at least about 9 μ g. h / ml / 100mg. 在另一个实施方案中，那非那韦甲磺酸盐（由位于La Jolla，CA的Agouron Pharmaceuticals，Inc.以商品名Viracept销售）是一种可配制成本发明剂型的HIV蛋白酶抑制剂。  In another embodiment, nelfinavir mesylate (located in the La Jolla, CA of Agouron Pharmaceuticals, Inc. Sold under the tradename Viracept) is formulated into dosage forms of the invention an HIV protease inhibitors . 本发明剂型显示了以可达到的高AUC、可达到的高Cmax(最大血浆浓度）和低Tmax(到达最大血浆浓度的时间）为特征的释放和吸收特性。  In the dosage form of the present invention show high attainable AUC, high attainable Cmax (maximum plasma concentration), and low Tmax of (time to reach maximum plasma concentration) for the release and absorption properties characterized. 在另一个实施方案中，本发明提供了其中所述HIV蛋白酶抑制剂是利托那韦和洛匹那韦的组合的剂型，所述剂型在狗中显示的利托那韦血浆浓度的剂量调节的AUC为至少约9 μ g. h/ml/100mg，显示的洛匹那韦血浆浓度的剂量调节的AUC为至少约20 μ g. h/ ml/100mg (优选至少约22. 5 μ g. h/ml/100mg，最优选至少约35 μ g. h/ml/100mg)。  In another embodiment, the present invention provides wherein said HIV protease inhibitor is a combination of dosage forms of ritonavir and lopinavir, the dosage form in dogs display ritonavir plasma concentration the dose-adjusted AUC of at least about 9 μ g. h / ml / 100mg, lopinavir plasma concentration Wei dose adjusted AUC display is at least about 20 μ g. h / ml / 100mg (preferably at least about 22.5 μ g. h / ml / 100mg, most preferably at least about 35 μ g. h / ml / 100mg). 术语"AUC"是指"曲线下面积"，使用其常规含义，即，如从0至24小时的血浆浓度-时间曲线下的面积，其中已经对非禁食状态下的狗（小猎犬）口服施用本发明的剂型。  The term "AUC" means "area under the curve", used in its conventional meaning, i.e. as blood plasma concentration from 0 to 24 hours - the area under the time curve, wherein the dog has been in the non-fasted state (small hounds) oral administration dosage forms of the present invention. "非禁食状态"是指在试验前和整个试验期间，狗接受营养平衡的每日定量配给食物。 "Non-fasting state" refers to and throughout the trial, nutritionally balanced dog accepted prior to the test daily ration of food. AUC具有浓度乘以时间的单位。 AUC has units of concentration times time. 一旦确定了实验浓度-时间点，即可方便的计算AUC，例如通过计算机程序或通过梯形法计算。 Once the experimental concentration - time point, the AUC can be calculated easily, for example, calculated by a computer program or by the trapezoidal method. 本文所有的AUC数据都剂量调节至IOOmg剂量水平。 All AUC data herein were dose adjusted to IOOmg dosage levels. 为了本文的目的，在剂量范围内测量AUC，其中AUC随剂量成比例增加。 For purposes herein, the AUC is measured dose range, wherein the AUC increases proportionally with dose. 给狗分别施用50mg利托那韦或200mg洛匹那韦，被视作适于测定本文使用的AUC值。 Dogs were administered 50mg or 200mg of ritonavir lopinavir, be considered suitable for determining the AUC values ​​as used herein. 根据本发明的剂型，其特征在于良好的稳定性和尤其是对活性成分的重结晶或分解作用显示了高抵抗性。  The dosage form according to the present invention, which is characterized by good stability and especially the active ingredient recrystallization or decomposition shows the high resistance. 因此，在40°C和75%湿度下保存6周（例如当保存于不含干燥剂的高密度聚乙烯（HDPE)瓶中）后，根据本发明的剂型通常不显示任何结晶迹象（如通过DSC或WAXS分析证明），并包含最初活性成分含量的至少约98% (如通过HPLC分析证明）。 Thus, stored for 6 weeks and 40 ° C under 75% humidity (e.g., when kept in high density without desiccant polyethylene (HDPE) bottles), the dosage form according to the present invention typically do not show any sign of crystallinity (as determined by DSC or WAXS analysis demonstrated), and comprising a first active ingredient content of at least about 98% (as determined by HPLC analysis demonstrated). 脱水山梨醇脂肪酸单酯类，例如脱水山梨醇单月桂酸酯（Span'®: 20)、脱水山梨醇单油酸酯、脱水山梨醇单棕榈酸酯（Span®.40)或脱水山梨醇硬脂酸酯，或 一种或多种它们的混合物。  sorbitan fatty acid mono esters such as sorbitan monolaurate (Span'®: 20), sorbitan monooleate, sorbitan monopalmitate (Span®.40) or dehydration sorbitan stearate, or  one or more mixtures thereof. 优选脱水山梨醇单脂肪酸酯，特别优选脱水山梨醇单月桂酸酯和脱水山梨醇单棕榈酸酯。  The sorbitan mono fatty acid ester is preferable, particularly preferably sorbitan monolaurate and sorbitan monopalmitate. 除了HLB值为约4到约10的表面活性剂以外，剂型还可包含另外的可药用表面活性剂例如聚氧乙烯蓖麻油衍生物类，例如聚氧乙烯甘油三蓖麻油酸酯或聚烃氧基35蓖麻油（polyoxyl35castor oil)(Crem()ph〇r®:EL;BASF Corp.)或聚氧乙稀甘油羟基硬脂酸酯例如聚乙二醇40氢化蓖麻油（CremophOT® RH40)或聚乙二醇60氢化蓖麻油( Cremophor® RH60);或环氧乙烷和环氧丙烷的嵌段共聚物，也称为聚氧乙烯聚氧丙烯嵌段共聚物或聚氧乙烯聚丙二醇，例如Poloxamer® 124、Poloxamer® l88、P〇l〇Xame禮237、 PoloxamerSUSSAPoloxamerdMOT^ASF Wyandotte Corp.);或聚氧乙稀（20)脱水山梨醇的单脂肪酸酯，例如聚氧乙烯（20)脱水山梨醇单油酸酯（Tween®80)、聚氧乙烯（20)脱水山梨醇单硬脂酸酯（Tween®60)、聚氧乙烯（20)脱水山梨醇单棕榈酸酯（Tween®40)、 聚氧乙烯（20)脱水山梨醇单月桂酸酯（Tween®:20)。  In addition to the surfactant having an HLB value from about 4 to about 10 outside, the dosage form may comprise additional pharmaceutically acceptable surfactants, polyoxyethylene castor oil derivatives, for example, such as polyoxyethylene triricinoleate or polyoxyl 35 castor oil (polyoxyl35castor oil) (Crem () ph〇r®: EL; BASF Corp.) or polyoxy ethylene glyceryl hydroxystearate such as polyethylene glycol 40 hydrogenated castor oil (CremophOT® RH40) or polyethylenglycol 60 hydrogenated castor oil (Cremophor® RH60); or a block copolymer of ethylene oxide and propylene oxide, also known as polyoxyethylene polyoxypropylene block copolymers or polyoxyethylene propylene glycol, e.g. Poloxamer® 124, Poloxamer® l88, Li P〇l〇Xame 237, PoloxamerSUSSAPoloxamerdMOT ^ ASF Wyandotte Corp.); or a mono fatty acid ester (20) polyoxy ethylene sorbitan, such as polyoxyethylene (20 ) sorbitan monooleate (Tween®80), polyoxyethylene (20) sorbitan monostearate (Tween®60), polyoxyethylene (20) sorbitan monopalmitate (Tween® 40), polyoxyethylene (20) sorbitan monolaurate (Tween®: 20). 当使用这些另外的表面活性剂时，HLB值为约4至约10的表面活性剂一般占所用表面活性剂总重量的至少约50%重量，优选至少约60%重量。  Further, when using these surfactants, an HLB value of a surfactant from about 4 to about 10 generally accounts for at least about 50% by weight of the total weight of the surfactant used, preferably at least about 60% by weight. 本发明所使用的水溶性聚合物具有至少50°C，优选至少约60°C，最优选约80°C至约180°C的Tg。 Water-soluble polymers used in the invention  This has at least 50 ° C, preferably at least about 60 ° C, most preferably from about 80 ° C to about Tg to 180 ° C. 有机聚合物的Tg值的测量方法描述于"Introduction to Physical Polymer Science" 第二版，LH Sperling 主编，John Wiley&Sons，Inc.于1992 年出版。 The method of measuring Tg values ​​of organic polymers are described in "Introduction to Physical Polymer Science", Second Edition, LH Sperling editor, John Wiley & Sons, Inc., Published in 1992. Tg 值可计算为由组成聚合物的每一单独单体衍生的均聚物的Tg值的加权和，即：Tg = E WiXi,其中W 是单体i在有机聚合物中重量百分比，X是由单体i衍生的均聚物的Tg值。 Tg values ​​may be calculated by weighting the value of Tg of a homopolymer of each individual monomers and polymers derived, namely: Tg = E WiXi, where W is the weight percent of monomer i in the organic polymer, X is derived from monomer i homopolymer Tg value. 均聚物的Tg值可得自"聚合物手册（PolymerHandbook) "第二版，J. Brandrup 和EH Immergut 主编，John Wiley&Sons，Inc.于1975 年出版。 Tg values ​​for homopolymers are available from "Polymer Handbook (Polymer Handbook)," Second Edition, J. Brandrup and EH Immergut editor, John Wiley & Sons, Inc., Published in 1975. 具有如上定义的Tg的水溶性聚合物允许用于固体分散体的制备，该固体分散体具有机械稳定性，以及在正常温度范围内充分的温度稳定性，以使固体分散体无需进一步处理就可用作剂型，或只需少量的压片助剂即可压制成片剂。  The water-soluble polymer having a Tg as defined above allow for the preparation of the solid dispersion, the solid dispersion has mechanical stability, and adequate temperature range in the normal temperature stability, so that the solid dispersion was used without further dosage forms may be used to process, or only a small amount of tabletting aids to be compressed into tablets. 寡糖和多糖类，例如角叉菜胶、半乳甘露聚糖和黄原胶，或它们的一种或多种的混合物。  oligo- and polysaccharides such as carrageenans, galactomannans and xanthan gum, or a mixture of one or more thereof. 当中，优选N-乙烯基吡咯烷酮的均聚物和共聚物，尤其是N-乙烯基吡咯烷酮和醋酸乙烯酯的共聚物。  Preferred among N- vinylpyrrolidone homopolymers and copolymers, especially copolymers of N- vinyl pyrrolidone and vinyl acetate. 特别优选的聚合物是以共聚物重量计约60%的N-乙烯基吡咯烷酮和以共聚物重量计约40%的醋酸乙烯酯的共聚物。 Particularly preferred polymers are copolymers of about 60% by weight of a copolymer of N- vinylpyrrolidone and to about 40% by weight of vinyl acetate. 本发明的剂型可包含至少一种常规的添加剂，例如流动调节剂、润滑剂、增量剂(填充剂）和崩解剂。  The formulations of the invention may comprise at least one conventional additive, such as flow regulators, lubricants, bulking agents (fillers) and disintegrants. 一般而言，添加剂占剂型重量的约0.01-15%重量。 In general, the additive comprises from about 0.01 to 15% by weight by weight of the dosage form. 根据本发明，可使用多种方法制备固体剂型。  According to the present invention, solid dosage forms may be prepared using a variety of methods. 这些方法包括制备在水溶性聚合物和表面活性剂的基质中的HIV蛋白酶抑制剂或HIV蛋白酶抑制剂的组合的固溶体，以及成形为所需要的片剂形式。 These methods include HIV protease or HIV protease inhibitors in a matrix of a water-soluble polymer and a surfactant in a solid solution of inhibitor in combination, and shaped into the desired form of a tablet preparation. 另外，固溶体产品可再细分为颗粒，例如通过研磨或碾磨，以及将颗粒再压制成片。 Further, the solid solution product may be subdivided to granules, e.g., by grinding or milling, and the particles were compressed into tablets. [0061 ] 现有的制备固溶体的多种方法包括熔化挤出、喷雾干燥和蒸发溶液，优选熔化挤出。  Existing methods for preparing a variety of solid solution comprising melt extrusion, spray drying, and evaporating the solution, preferably melt extruded. 熔化挤出方法包含的步骤有制备HIV蛋白酶抑制剂或HIV蛋白酶抑制剂的组合、 水溶性聚合物和表面活性剂的均匀熔化物，和冷却熔化物直至其固化。 Step  The method comprises melt extruding a composition prepared with a HIV protease inhibitor or HIV protease inhibitor, and a water-soluble polymer uniformly melt the surfactant, and cooling the melt until it solidifies. "熔化"是指转化为液体或似橡胶状态，其中可能一种组分均匀包埋于其它组分中。 "Melt" refers to liquid or rubbery state in which one component may be embedded homogeneously in the other components. 一般，一种组分熔化，其它组分溶于熔化物中，因而形成溶液。 Usually, one of the components melt and the other components are dissolved in the melt thus forming a solution. 熔化通常涉及加热高于水溶性聚合物的软化点。 Melting generally involves heating above the softening point of the water-soluble polymer. 熔化物的制备可通过多种方法来发生。 Preparation of the melt can take place by various methods. 在熔化物形成之前、形成期间或形成之后可进行组分的混合。 Before the melt is formed, or after the mixing of the components during the formation can be formed. 例如，首先进行组分的混合，然后熔化或同时混合和熔化。 For example, first, mixing of the components, and then melted or simultaneously mixed and melted. 通常，将熔化物匀化以有效的分散活性成分。 Typically, the melt is homogenized in order to disperse the active ingredients efficiently. 而且，也可以先熔化水溶性聚合物然后混合和匀化活性成分。 Further, the water soluble polymer may be first melted and the active ingredient mixed and homogenized. 通常，熔融温度为约70至约250°C，优选约80至约180°C，最优选约100至约140。  Generally, a melting temperature of from about 70 to about 250 ° C, preferably from about 80 to about 180 ° C, and most preferably from about 100 to about 140. 。 . 。 . 活性成分可以其自身形式来使用，或以在适宜溶剂中的溶液或分散体来使用，适宜的溶剂例如醇类、脂族烃类或酯类。  The active ingredient may be used in the form of its own, or as a solution or dispersion in a suitable solvent is used, suitable solvent such as alcohols, aliphatic hydrocarbons or esters. 可使用的另一种溶剂是液体二氧化碳。 Another solvent which can be used is liquid carbon dioxide. 在制备熔化物时除去溶剂，例如蒸发。 The solvent was removed in the preparation of the melt, such as evaporation. 熔化物中可包含多种添加剂，例如流动调节剂如胶态二氧化硅、润滑剂、填充剂、 崩解剂、增塑剂、稳定剂例如抗氧剂、光稳定剂、自由基清除剂、对抗微生物攻击的稳定剂。  The melt may contain various additives, for example flow regulators such as colloidal silica, lubricants, fillers, disintegrants, plasticizers, stabilizers such as antioxidants, light stabilizers, free radical scavengers, stabilizers against microbial attack. 熔化和/或混合可在用于该目的的常规装置中进行。  The melting and / or mixing may be carried out in a conventional means used for this purpose. 特别适合的是挤压机或捏和机。 Particularly suitable are extruders or kneaders. 适宜的挤压机包括单螺杆挤压机、啮合螺杆挤压机或其它多螺杆挤压机，优选双螺杆挤压机，其可以顺转或逆转，并任选地装有捏和盘。 Suitable extruders include single screw extruders, intermeshing screw extruders or other multiple screw extruder, preferably a twin screw extruder, which can be clockwise or reverse, and, optionally, with kneading disks. 应当理解，工作温度也将由所使用的挤压机类型或挤压机的构造类型来决定。 It should be appreciated that the working temperatures will also be constructed type extruder or an extruder type to be used is determined. 在挤压机中组分的熔化、混合和溶解所需要的部分能量可通过加热元件来提供。 Part of the energy component in the extruder to melt, mix and dissolve the required may be provided by a heating element. 然而，挤压机中材料的摩擦和剪切也可给混合物提供大量的能量，并帮助组分均匀熔化物的形成。 However, the material extrusion machines and shearing friction may also provide significant energy to the mixture and aid in the formation of the components are uniformly melt. 熔化程度从糊状到粘稠状。  melting degree from pasty to viscous. 挤出物的成型是通过带有两个在其表面具有相互匹配的凹陷的逆向旋转滚筒的压延机来方便地进行的。 Shaping of the extrudate conveniently is carried out by a calender with two counter-rotating rollers having mutually matching depressions on their surface. 宽范围的片剂形式可通过使用带有不同凹陷形式的滚筒来获得。 Broad range of tablet forms can be obtained by using rollers with different forms of depressions. 或者，在固化前（热切）或固化后（冷切）将挤出物切成块。 Alternatively, prior to curing (eagerly) or cured (cold-cut) cutting the extrudate into pieces. 任选地，所得固溶体产品是碾磨或研磨成颗粒。  Optionally, the resulting solid solution product is milled or ground to granules. 然后颗粒可被压缩。 Particles may then be compressed. 压缩是指使包含颗粒的粉末在高压下变得稠密以获得具有低孔隙率的致密物（例如片剂）的过程。 Compression refers to a powder comprising particles become dense at high pressures in order to obtain a compact having a low porosity (e.g., tablets) of the process. 粉末的压缩通常是在压片机中进行，更具体的是在两移动冲头之间的钢冲模中进行。 Compressing the powder is usually done in a tablet press, more specifically in the steel die between two moving punches. 当本发明的固体剂型包含多于一种的HIV蛋白酶抑制剂的组合（或HIV蛋白酶抑制剂与一种或多种其它活性成分的组合）时，分别制备单独活性成分的固溶体产品，并在压制前混合碾磨或研磨的产品当然是可能的。 When the solid dosage form compositions of the present invention comprises more than one HIV protease inhibitor (or a combination of one or more HIV protease inhibitors in combination with one other active ingredient), were prepared solid solution products of the individual active ingredients, and compressed grinding or milling prior to mixing products are of course possible. 优选地，在压制颗粒中使用的至少一种选自流动调节剂、崩解剂、增量剂（填充剂）和润滑剂的添加剂。  Preferably, at least one particle selected for use in the press flow regulators, disintegrants, bulking agents (fillers) and lubricants. 崩解剂促进压制物在胃中快速崩解，并保持释放出的颗粒彼此分隔。 Disintegrants promote a rapid disintegration of the compact in the stomach and keep the liberated granules separated from each other. 适宜的崩解剂是交联聚合物，例如交联聚乙烯吡咯烷酮和交联羧甲基纤维素钠。 Suitable disintegrants are crosslinked polymers such as crosslinked polyvinylpyrrolidone and crosslinked sodium carboxymethylcellulose. 适宜的增量剂（也称作"填充剂"）选自乳糖、磷酸氢钙、微晶纤维素（Avicell®)、硅酸盐，尤其是二氧化硅、氧化镁、滑石粉、马铃薯淀粉或玉米淀粉、异麦芽糖（isomalt)、聚乙烯醇。 Suitable bulking agents (also referred to as "fillers") are selected from lactose, calcium hydrogenphosphate, microcrystalline cellulose (Avicell®), silicates, in particular silica, magnesia, talc, potato starch, or corn starch, isomalt (isomalt), polyvinyl alcohol. 适宜的流动调节剂选自高分散性二氧化硅(Aerosil®)和动物或植物脂肪或蜡。  Suitable flow regulators are selected from highly dispersed silica (AEROSIL®), and animal or vegetable fats or waxes. 在压制颗粒中优选使用润滑剂。  In the lubricant is preferably used in compacting the granules. 适宜的润滑剂选自聚乙二醇（例如分子量为1000 至6000)、硬脂酸镁和硬脂酸钙、硬脂基富马酸钠等。 Suitable lubricants are selected from polyethylene glycol (e.g. of molecular weight 1000 to 6000), magnesium stearate and calcium stearate, sodium stearyl fumarate and the like. 可使用多种其它添加剂，例如染料如偶氮染料、有机或无机颜料如氧化铝或二氧化钛、或天然来源的染料；稳定剂例如抗氧剂、光稳定剂、自由剂清除剂、对抗微生物攻击的稳定剂。  Various other additives may be used, for example dyes such as azo dyes, organic or inorganic pigments such as aluminum oxide or titanium dioxide, or dyes of natural origin; stabilizers such as antioxidants, light stabilizers, free scavengers against microbial attack stabilizer. 本发明的剂型可以以包含几层的剂型来提供，例如层压片或多层片。  The dosage forms of the present invention may comprise several layers to provide a dosage form, such as a laminate sheet or a multilayer sheet. 它们可处于开放或封闭的形式。 They may be in open or closed form. "封闭剂型"是指其中一层完全被至少一层其它层包围的剂型。 "Closed dosage forms" refers to dosage forms which one layer is completely surrounded by at least one other layer. 多层剂型其优点在于可加工互不相容的两种活性组分，或者可控制活性成分的释放特性。 The multilayer dosage form has the advantage that two active ingredients workability mutually incompatible, or can control the release profile of the active ingredient. 例如，其使得通过在外层中的一层包含活性成分来提供最初剂量，和在内层包含活性成分来提供维持剂量成为可能。 For example, in the outer layer through which such a layer containing the active ingredient to provide an initial dose, and the inner layer comprising the active ingredient becomes possible to provide a maintenance dose. 多层片类型可通过压制两层或更多层颗粒来产生。 The multilayer type chip can be produced by compressing two or more layers of granules. 或者，多层剂型可通过已知的"共挤出"的方法来制备。 Alternatively, multilayer dosage forms may be prepared by the process of "co-extruded" known. 实质上，该方法包括如上面所解释的至少两种不同熔化物组合物的制备，以及将这些熔化组合物置于联合共挤出冲模中。 In essence, the method comprising preparing a different melt compositions as explained above, at least two, and the melt composition in these joint coextrusion die. 共挤出冲模的形状取决于所要的药物形状。 Coextrusion die depends on the shape of the desired shape of the medicament. 例如，具有平坦模隙的冲模（称作槽冲模）和具有环状裂缝的冲模是适宜的。 For example, a flat die having a die gap (referred to as a slot die), and a die having an annular fracture are suitable. 为了便于哺乳动物摄取这样的剂型，赋予剂型以适宜的形状是有利的。  In order to facilitate such uptake mammals a dosage form, in a suitable dosage form to impart advantageous. 因此可方便吞咽的大片剂在形状上优选伸长型（elongated)的而不是圆形。 So they can easily swallow large tablets preferably elongated (Elongated) rather than round in shape. 片剂上的膜包衣还有助于可吞咽的舒适性。  The film coat on the tablet further contributes to the comfort of a swallowable. 膜包衣也可改善味道和提供精致的外观。 A film coating may also improve the taste and to provide refined look. 如果需要，膜包衣可以是肠溶包衣。 If desired, the film coat may be an enteric coating. 膜包衣通常包含聚合成膜材料，例如羟丙甲基纤维素、羟丙基纤维素和丙烯酸酯或甲基丙烯酸酯共聚物。 Film coating typically comprises polymeric film-forming material, such as hydroxypropyl methylcellulose, hydroxypropyl cellulose, and acrylate or methacrylate copolymers. 除成膜聚合物外，膜包衣还可包含增塑剂如聚乙二醇、表面活性剂例如Tween®:类型，以及任选的颜料例如二氧化钛或铁氧化物。 In addition to the film-forming polymer, the film coat may further comprise a plasticizer such as polyethylene glycol, surfactants such as Tween®: type, and optionally a pigment such as titanium dioxide or iron oxide. 膜包衣也可包含作为抗粘剂的滑石粉。 The film coating may also comprise talc as anti-tack agent. 膜包衣占剂型重量的小于约5%。 The film coating comprises less than about 5% by weight of the formulation. 如本领域技术人员所公知的，给药的准确剂量和频率取决于具体患者受治疗的具体病症、年龄、体重和一般身体情况，和个体服用的其它药物。  As the skilled person is well known, exact dosage and frequency of administration depends on the particular condition of the particular patient being treated, the age, weight and general physical condition and other medication the individual taking. 下面的表1显示了用于联合给药利托那韦/洛匹那韦的本发明的示范性组合物， 数值为重量％。  The following Table 1 shows an exemplary composition for combined administration of ritonavir / lopinavir present invention, the value of wt%. 上面的组合物通过熔融挤出法来制备。 To prepare  The above compositions by melt extrusion. 所得挤出物可以原形式使用，或碾磨并压片，优选使用适宜的压片辅助剂例如硬脂基富马酸钠、胶态二氧化硅、乳糖、异麦芽糖、硅酸钙和硬脂酸镁、纤维素或磷酸氢钙。 The resulting extrudate can be used in the form of the original, or milled and compressed into tablets, preferably using a suitable tableting adjuvants such as sodium stearyl fumarate, colloidal silica, lactose, isomalt, calcium silicate, and stearyl magnesium, cellulose or calcium hydrogen phosphate. 下述的非限制性实施例将进一步阐述本发明。  The following non-limiting examples will further illustrate the invention. 狗（小猎犬，混合性别、体重约IOkg)接受含27 %脂肪的平衡饮食，并允许自由饮水。  Dogs (beagle, mixed gender, weighing about IOkg) accepts a balanced diet containing 27% fat, and allowed free access to water. 在给药前约30分钟，每只狗皮下给药lOOyg/kg剂量的组胺。 About 30 minutes, each administration of the sticking lOOyg / kg dose of histamine prior to administration. 对每只狗给药分别相应于约200mg洛匹那韦、约50mg利托那韦、或约200mg洛匹那韦和约50mg利托那韦的单剂量。 They are administered to each dog corresponding to about 200mg lopinavir, ritonavir about 50mg, or about 200mg and about 50mg lopinavir single dose of ritonavir. 接着给予约10毫升水。 Then about 10 ml of water was administered. 在给药前和给药后〇. 25、0. 5、1. 0、1. 5、2、3、4、6、8、10、12和24小时采集血样。 In the pre-dose and after administration square. 25,0. 5,1. 0,1. 5,2,3,4,6,8,10,12 and 24 hours blood samples were collected. 血浆通过离心与红细胞分离并冷冻（_30°C)至分析。 Plasma was separated and frozen (_30 ° C) and red blood cells by centrifugation to analysis. 血浆样品经液-液萃取后，用带有低波长UV检测器的反相HPLC来测定HIV蛋白酶抑制剂的浓度。 Plasma samples by liquid - liquid extraction, by reverse phase HPLC with low wavelength UV detector to determine the concentration of HIV protease inhibitors. 在整个研宄期间，通过梯形法计算曲线下面积（AUC)。 Throughout the study based on the calculated area under the curve (AUC) by the trapezoidal method. 根据含有8只狗的组来评估每种剂型，报告值为每组狗的平均值。 The group containing 8 dogs each dosage evaluated, reporting the average value of each group of dogs. 混合共聚维酮（N-乙烯基吡咯烷酮/醋酸乙烯酯共聚物60 :40, 78. 17重量份）与利托那韦（4. 16重量份）、洛匹那韦（16. 67重量份）和胶态二氧化硅（I. 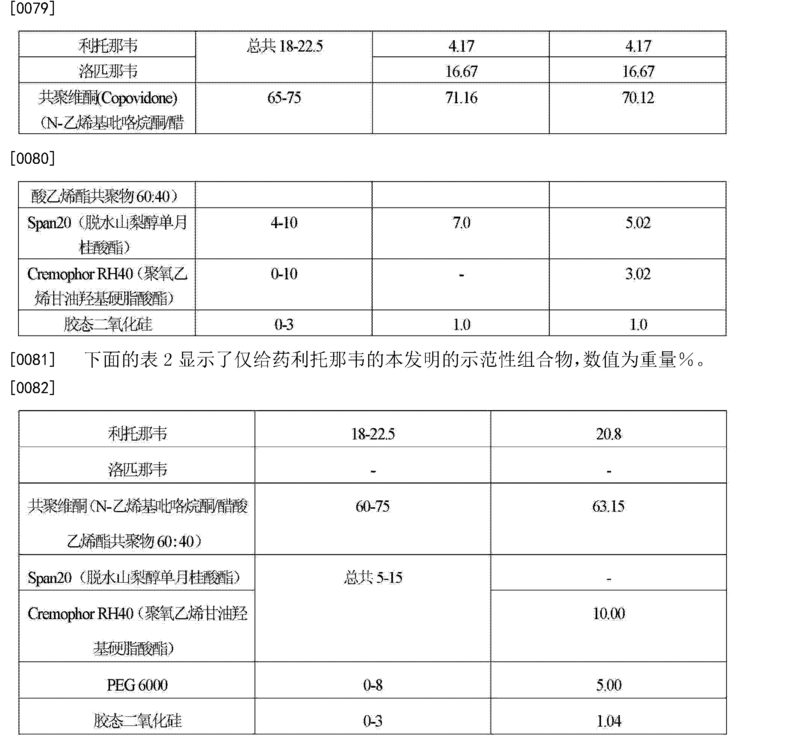 0重量份）。  mixing copovidone (N- vinyl pyrrolidone / vinyl acetate copolymer 60: 40, 78.17 parts by weight) with ritonavir (4.16 parts by weight), lopinavir (16.67 parts by weight) and colloidal silica (I. 0 parts by weight). 然后将粉末状混合物进料入速度为2. Okg/h、熔融温度为133°C的双螺杆挤压机中（螺杆直径18_)。 The powdery mixture was then fed into a rate of 2. Okg / h, a melt temperature of 133 ° C in a twin-screw extruder (screw diameter 18_). 将澄清、全透明的熔化物进料入带有两个在其表面具有相互匹配的空腔的逆向旋转滚筒的压延机中。 The clear, fully transparent melt was fed to a calender with two counter-rotating rollers having mutually matching cavities on their surfaces. 因而得到1080mg片剂。 1080mg tablets thus obtained. DSC和WAXS分析没有显示出在制剂中存在任何晶态药物原料的证据。 DSC and WAXS analysis did not show evidence of the presence of any crystalline material in the drug formulation. 在狗中利托那韦的剂量调节的AUC是0. 52 μ g. h/ml/100mg，洛匹那韦的是4. 54 μ g. h/ml/100mg。  In dogs ritonavir dose-adjusted AUC of a 0. 52 μ g. H / ml / 100mg, lopinavir is 4. 54 μ g. H / ml / 100mg. 该实施例显示未添加表面活性剂的HIV蛋白酶抑制剂的固溶体获得极低生物利用度。 This example shows that solid solutions of non-surfactant is added to obtain HIV protease inhibitors is extremely low bioavailability. 在Diosna高剪切混合机中，将共聚维酮（N-乙烯基吡咯烷酮/醋酸乙烯酯共聚物60 :40,68. 17重量份）与CremophorRMO (聚氧乙烯甘油羟基硬脂酸酯，10. 00重量份）混合。  in a Diosna high shear mixer, Copovidone (N- vinyl pyrrolidone / vinyl acetate copolymer 60: 17 parts by weight 40,68) and CremophorRMO (polyoxyethylene glycerol hydroxy stearate , 10.00 parts by weight) were mixed. 所得颗粒与利托那韦（4. 17重量份）、洛匹那韦（16. 67重量份）和胶态二氧化硅（1. 00 重量份）混合。 The resulting granules were mixed with ritonavir (4.17 parts by weight), lopinavir (16.67 parts by weight) and colloidal silica (1.00 parts by weight) were mixed. 然后将粉末状混合物进料入速度为2. 3kg/h、熔融温度为126°C的Leistritz Microl8双螺杆挤压机中。 The powdery mixture was then fed into a rate of 2. 3kg / h, melt temperature of 126 ° C Leistritz Microl8 twin-screw extruder. 将挤出物切成块并允许其固化。 The extrudate was cut into pieces and allowed to solidify. 使用高抗冲万能研磨机研磨挤出物的块。 Using a high impact universal mill was extruded block. 研磨过的材料（86. 49重量份）在箱式混合器（bin blender)中与一水合乳糖(6. 00重量份）、交联PVP (6. 00重量份）、胶态二氧化硅（1. 00重量份）和硬脂酸镁（0· 51 重量份）混合。 The milled material (86.49 parts by weight) in the box-type mixer (bin blender) with lactose monohydrate (6.00 parts by weight), the crosslinking of PVP (6.00 parts by weight), colloidal silica ( 1.00 parts by weight) and magnesium stearate (0.51 parts by weight) were mixed. 粉末状混合物在Fette El型单冲压片机中压制为1378. Omg的片剂。 Powdered mixture is compressed to tablets in 1378. Omg Fette El single punch tablet machine. 然后于60°C在包衣锅中通过喷雾膜包衣用水性分散体（Opadry，得自Colorcon)对片剂进行膜包衣。 At 60 ° C was then sprayed with an aqueous dispersion of a film coating (Opadry, available from Colorcon) film-coated tablets in a coating pan by. 在狗中利托那韦的剂量调节的AUC是0. 60 μ g. h/ml/100mg，洛匹那韦的是7. 43 μ g. h/ml/100mg。  In dogs ritonavir dose-adjusted AUC of a 0. 60 μ g. H / ml / 100mg, lopinavir is 7. 43 μ g. H / ml / 100mg. 该实施例显示将表面活性剂引入HIV蛋白酶抑制剂的固溶体提高了获得的生物利用度。 This example shows that the surface active agents into solid solutions of HIV protease inhibitors improves the bioavailability obtained. 在Diosna高剪切混合机中，将共聚维酮（N-乙烯基吡咯烷酮/醋酸乙烯酯共聚物60 :40,853. 8重量份）与Span20 (脱水山梨醇单月桂酸酯，83. 9重量份）混合。  in a Diosna high shear mixer, Copovidone (N- vinyl pyrrolidone / vinyl acetate copolymer 60: 40,853 parts by weight 8). And Span 20 (sorbitan monolaurate, 839 parts by weight) were mixed. 所得颗粒与利托那韦（50重量份）、洛匹那韦（200重量份）和胶态二氧化硅（12重量份）混合。 The resulting granules were mixed with ritonavir (50 parts by weight), lopinavir (200 parts by weight) and colloidal silica (12 parts by weight) were mixed. 然后将粉末状混合物进料入速度为2. lkg/h、熔融温度为119°C的双螺杆挤压机（螺杆直径18_)中。 The powdery mixture was then fed into a rate of 2. lkg / h, a melt temperature of 119 ° C in a twin-screw extruder (screw diameter 18_) of. 将挤出物进料入带有两个在其表面具有相互匹配的空腔的逆向旋转滚筒的压延机中。 The extrudate was fed to a calender with two counter-rotating rollers having mutually matching cavities on their surfaces. 因而得到1120mg片剂。 1120mg tablets thus obtained. 在狗中利托那韦的剂量调节的AUC是10. 88 μ g. h/ml/100mg，洛匹那韦的是51. 2 μ g. h/ml/100mg。  In dogs the dose of ritonavir is adjusted AUC 10. 88 μ g. H / ml / 100mg, lopinavir was 51. 2 μ g. H / ml / 100mg. 该实施例显示将具有4至10的HLB值的表面活性剂引入HIV蛋白酶抑制剂的固溶体明显提高了获得的生物利用度。 This example shows that the surfactant having an HLB value of 4 to 10 is introduced into solid solutions of HIV protease inhibitors markedly improves the bioavailability obtained. 尽管如此，重复实施例2,挤出物被剪切成块并允许固化。  Nevertheless, Example 2 was repeated, the extrudate is cut into pieces and allowed to solidify. 使用高抗冲万能研磨机将挤出的块研磨至颗粒大小约250 μ m。 Polishing block using a high impact universal mill extruded to a particle size of about 250 μ m. 将研磨过的材料在箱式混合器中与硬脂基富马酸钠(12. 3重量份）和胶态二氧化硅（8. 0重量份）混合20分钟。 The ground material was colloidal silica (8.0 parts by weight) were mixed 20 minutes and sodium stearyl fumarate (12.3 parts by weight) in a bin blender. 将粉末状混合物在三冲旋转压片机中压制。 The powdery mixture was pressed at three punch rotary tableting machine. 然后于60°C温度下在包衣锅中通过喷雾膜包衣用水性分散体（Opadry)进行片剂的膜包衣。 Then at a temperature of 60 ° C for film coating tablets in a coating pan by spraying an aqueous dispersion of a film coating (Opadry). 在Diosna高剪切混合机中，将共聚维酮（N-乙烯基吡咯烷酮/醋酸乙烯酯共聚物60 :40,841. 3重量份）与CremophorRMO (聚氧乙烯甘油羟基硬脂酸酯，36. 2重量份）、 Span20(脱水山梨醇单月桂酸酯，60. 2重量份）混合。  in a Diosna high shear mixer, Copovidone (N- vinyl pyrrolidone / vinyl acetate copolymer 60: 3 parts by weight of 40,841) and CremophorRMO (polyoxyethylene glycerol hydroxy stearate, 36 2 parts by weight), Span 20 (sorbitan monolaurate, 60.2 parts by weight) were mixed. 所得颗粒与利托那韦（50重量份）、 洛匹那韦（200重量份）和胶态二氧化硅（12重量份）混合。 The resulting granules were mixed with ritonavir (50 parts by weight), lopinavir (200 parts by weight) and colloidal silica (12 parts by weight) were mixed. 然后将粉末状混合物进料入速度为2. lkg/h、熔融温度为114°C的双螺杆挤压机（螺杆直径18_)中。 The powdery mixture was then fed into a rate of 2. lkg / h, a melt temperature of 114 ° C in a twin-screw extruder (screw diameter 18_) of. 将挤出物进料入带有两个在其表面具有相互匹配的空腔的逆向旋转滚筒的压延机中。 The extrudate was fed to a calender with two counter-rotating rollers having mutually matching cavities on their surfaces. 因而得到1120mg片剂。 1120mg tablets thus obtained. 在狗中利托那韦的剂量调节的AUC是10. 96 μ g. h/ml/100mg，洛匹那韦的是46. 5 μ g. h/ml/100mg。  In dogs the dose of ritonavir is adjusted AUC 10. 96 μ g. H / ml / 100mg, lopinavir is 46. 5 μ g. H / ml / 100mg. 该实施例显示具有4至10的HLB值的表面活性剂与另一种表面活性剂的组合可成功的使用。 This example shows that a combination of a surfactant with another surfactant having an HLB value of 4-10 may be successfully used. 尽管如此，重复实施例4,挤出物被剪切成块并允许固化。  Nevertheless, Example 4 was repeated, the extrudate is cut into pieces and allowed to solidify. 使用高抗冲万能研磨机将挤出的块研磨至颗粒大小约250 μπι。 Polishing block using a high impact universal mill extruded to a particle size of about 250 μπι. 研磨过的材料在箱式混合器中与硬脂基富马酸钠(13. 9重量份）、胶态二氧化硅（7.0重量份）、异麦芽糖DC100 (159. 4重量份）和硅酸钙(7. 0重量份）混合20分钟。 The milled material in a bin blender with sodium stearyl fumarate (13.9 parts by weight), colloidal silica (7.0 parts by weight), isomalt DC100 (159. 4 parts by weight) and silicic acid calcium (7.0 parts by weight) were mixed for 20 minutes. 如实施例1所描述的压制混合物并膜包衣。 As described in Example 1 and a film coating mixture is pressed. 在Diosna高剪切混合机中，将共聚维酮（N-乙烯基吡咯烷酮/醋酸乙烯酯共聚物60 :40,683. 3重量份）与Span40 (脱水山梨醇单棕榈酸酯，67. 2重量份）混合。  in a Diosna high shear mixer, Copovidone (N- vinyl pyrrolidone / vinyl acetate copolymer 60: 3 parts by weight of 40,683) and Span40 (sorbitan monopalmitate, 672. parts by weight) were mixed. 所得颗粒与洛匹那韦（200重量份）和胶态二氧化硅（9. 6重量份）混合。 The resulting granules with lopinavir (200 parts by weight) and colloidal silica (9.6 parts by weight) were mixed. 然后将粉末状混合物进料入速度为2. lkg/h、熔融温度为119°C的双螺杆挤压机（螺杆直径18_)中。 The powdery mixture was then fed into a rate of 2. lkg / h, a melt temperature of 119 ° C in a twin-screw extruder (screw diameter 18_) of. 挤出物被剪切成块并允许固化。 The extrudate is cut into pieces and allowed to solidify. 使用高抗冲万能研磨机研磨挤出的块。 Using a high impact universal mill extruded block. 研磨过的材料在箱式混合器中与硬脂基富马酸钠（7. 9重量份）、胶态二氧化硅（11. 3重量份）、异麦芽糖DC100 (129. 1重量份）和十二烷基硫酸钠（15. 6重量份）混合。 The milled material in a bin blender with sodium stearyl fumarate (7.9 parts by weight), colloidal silica (11.3 parts by weight), isomalt DC100 (129. 1 parts by weight) and sodium dodecyl sulfate (15.6 parts by weight) were mixed. 如实施例1所描述的压制混合物并膜包衣。 As described in Example 1 and a film coating mixture is pressed. 将相当于200mg洛匹那韦的片剂与50mg利托那韦一起给药狗。  equivalent to 200mg lopinavir and 50mg tablets dogs administered with ritonavir. 洛匹那韦的剂量调节的AUC 是38. 8 μ g. h/ml/100mg。 Lopinavir dose-adjusted AUC is the 38. 8 μ g. H / ml / 100mg. 在Diosna高剪切混合机中，将共聚维酮（N-乙烯基吡咯烷酮/醋酸乙烯酯共聚物60 :40,151. 5重量份）与CremophorRMO (24重量份）和PEG6000 (12重量份）混合。  in a Diosna high shear mixer, Copovidone (N- vinyl pyrrolidone / vinyl acetate copolymer 60: 5 parts by weight of 40,151) and CremophorRMO (24 parts by weight) and of PEG6000 (12 parts by weight) mixing. 所得颗粒与利托那韦（50重量份）和胶态二氧化硅（2. 4重量份）混合。 The resulting granules were mixed with ritonavir (50 parts by weight) and colloidal silica (2.4 parts by weight) were mixed. 然后将粉末状混合物进料入双螺杆挤压机并熔融挤出。 The powdery mixture was then fed into a twin-screw extruder and melt-extruded. 挤出物被剪切成块并允许固化。 The extrudate is cut into pieces and allowed to solidify. 使用高抗冲万能研磨机将挤出的块研磨。 Milling block using a high impact universal mill extruded. 研磨过的材料在箱式混合器中与胶态二氧化硅（1.4重量份）、异麦芽糖DClOO (31. 9重量份）和硅酸钙（4. 2重量份）混合。 The milled material in a bin blender with colloidal silica (1.4 parts by weight), isomalt DClOO (31. 9 parts by weight) and calcium silicate (4.2 parts by weight) were mixed. 如实施例1所描述的压制混合物并膜包衣。 As described in Example 1 and a film coating mixture is pressed. 在狗中剂量调节的AUC是9. 98 μ g. h/ml/100mg。  The dose-adjusted AUC in dogs was 9. 98 μ g. H / ml / 100mg. 1. 固体药物剂型，其包含至少一种HIV蛋白酶抑制剂和至少一种可药用水溶性聚合物和至少一种可药用表面活性剂的固体分散体，其中所述可药用水溶性聚合物具有至少50°C的Tg，所述至少一种可药用表面活性剂包括具有4至10的HLB值的非离子性表面活性剂，并且所述至少一种HIV蛋白酶抑制剂包括（2S，3S，5S)-5-(N-(N-((N-甲基-N-((2-异丙基-4-噻唑基）甲基）氨基）羰基）-L-缬氨酰基）氨基-2- (N- ((5-噻唑基）甲氧基-羰基）_氨基）_氨基_1，6-二苯基_3_羟基己烧（利托那韦）。 A solid pharmaceutical dosage form, comprising at least one HIV protease inhibitor and at least one pharmaceutically acceptable water soluble polymer and at least one pharmaceutically acceptable surfactant is a solid dispersion, wherein said pharmaceutically acceptable water-soluble polymer has a Tg of 50 ° C at least, the at least one pharmaceutically acceptable surfactant comprises a nonionic surfactant having an HLB value of 4-10, and the at least one HIV protease inhibitors include (2S, 3S, 5S) -5- (N- (N - ((N- methyl -N - ((2- isopropyl-4-thiazolyl) methyl) amino) carbonyl) -L- valyl) amino -2- (N- ((5- thiazolyl) methoxy - carbonyl) amino _) _ _3_ hydroxy-diphenyl-amino hexyl _1,6- burn (ritonavir). 2. 权利要求1的剂型，其包含所述HIV蛋白酶抑制剂的玻璃态溶液或固溶体。 2. The dosage form of claim 1, comprising a glassy solution or solid solution of the HIV protease inhibitor. 3. 权利要求1的剂型，其中所述可药用表面活性剂是至少一种具有4至10的HLB值的可药用表面活性剂和至少一种另外的可药用表面活性剂的组合。 And it may be a combination of at least one additional pharmaceutically acceptable surfactant may be a pharmaceutically acceptable surfactant dosage form of claim 1, wherein said pharmaceutically acceptable surfactant is at least one has an HLB value of 4-10. 4. 权利要求1的剂型，其中所述可药用表面活性剂是脱水山梨醇脂肪酸酯。 4. The dosage form of claim 1, wherein said pharmaceutically acceptable surfactant is a sorbitan fatty acid ester. 5. 权利要求1的剂型，其包含占剂型重量5至30%重量的所述HIV蛋白酶抑制剂、占剂型重量50至85%重量的所述水溶性聚合物、占剂型重量2至20%重量的所述表面活性剂和占剂型重量〇至15%重量的添加剂。 5. The dosage form of claim 1, which comprises from 5 to 30% by weight of the dosage form by weight of HIV protease inhibitors, accounting for 50-85% of the weight of the water-soluble polymer by weight of the dosage form, the dosage form representing 2 to 20% by weight by weight surfactant and the weight of the dosage form of square to 15% by weight of additives. 6. 权利要求1的剂型，其中所述至少一种HIV蛋白酶抑制剂还包括选自下列的HIV蛋白酶抑制剂： (2S，3S，5S) -2- (2, 6-二甲基苯氧基乙酰基）氨基-3-羟基-5- [2S- (1-四氢-嘧啶-2-酮基）-3-甲基丁酰基]-氨基-1，6-二苯基己烷（洛匹那韦）； N- (2 (R)-羟基-I (S)-茚满基）-2 (R)-苯基甲基-4 (S)-羟基-5- (1- (4- (3-吡啶基甲基）-2(S)-N'_(叔丁基甲酰氨基）-哌嗪基））-戊酰胺（印地那韦）； N-叔丁基-十氢-2- [2 (R)-羟基-4-苯基-3 (S) - [ [N- (2-喹啉基羰基）-L-天冬酰胺酰基]氨基]丁基]-(4&3,8&幻-异喹啉-3(幻-甲酰胺（沙奎那韦）； 5 (S) -Boc-氨基-4 (S)-羟基-6-苯基-2 (R)苯基甲基己酰基-(L) -Val- (L) -Phe-吗啉-4-基酰胺； 1-萘氧基乙酰基-0 _甲硫基-Ala-(2S，3S) 3-氨基-2-羟基-4- 丁酰基-1，3-噻唑烧_4_叔丁基酰胺； 5_异喹啉氧基乙酰基-0 -甲硫基-Ala-(2S，3S) -3-氨基-2-羟基-4-丁酰基-1，3-噻唑烷-4-叔丁基酰胺 6. The dosage form of claim 1, wherein said at least one HIV protease inhibitor further comprises an HIV protease inhibitor selected from the group consisting of: (2S, 3S, 5S) -2- (2, 6- dimethylphenoxy acetyl) amino-3-hydroxy -5- [2S- (1- tetrahydro - pyrimidin-2-onyl) -3-methylbutanoyl] - amino-1,6-diphenylhexane (lopinavir lopinavir); N- (2 (R) - hydroxy -I (S) - indanyl) -2 (R) - phenylmethyl -4 (S) - hydroxy-5- (1- (4- ( 3-pyridylmethyl) -2 (S) -N '_ (t-butylcarboxamido) - piperazinyl)) - pentaneamide (indinavir); N-tert-butyl - decahydro-2- [ 2 (R) - hydroxy-4-phenyl -3 (S) - [[N- (2- quinolyl-carbonyl) -L- asparaginyl] amino] butyl] - (4 & 3,8 & magic - iso quinoline-3 (magic - carboxamide (saquinavir); 5 (S) -Boc- amino -4 (S) - hydroxy-6-phenyl -2 (R) phenylmethyl hexanoyl - (L ) -Val- (L) -Phe- morpholin-4-carboxamide; -0-acetyl-1-naphthyloxy _ methylthio -Ala- (2S, 3S) 3- amino-2-hydroxy-4-butoxy _4_ burn-1,3-thiazole butylamide; 5_ isoquinolin-phenoxyacetyl -0-- methylthio -Ala- (2S, 3S) -3- amino-2-hydroxy-4- butyryl-1,3-thiazolidin-4-t-butylamide [lS-ElR-OHjSONLQ-mai-二甲基乙基）氨基]羰基](2-甲基丙基）氨基]_2_羟基_1_(苯基甲基）丙基]_2_[ (2-喹啉基幾基）氨基]-丁二酰胺； 安瑞那韦（VX-478) ;DMP-323 ;DMP-450 ;AG1343(奈非那韦）； 阿扎那韦（BMS 232,632); 替拉那韦； 帕利那韦； TMC-I14 ； R0033-4649 ； 福沙那韦（GW433908); P-1946 ； BMS186, 318 ;SC-55389a ;BILA1096 BS ;和U-140690， 或它们的组合。 [LS-ElR-OHjSONLQ-mai--dimethylethyl) amino] carbonyl] (2-methylpropyl) amino] _1_ _2_ hydroxy (phenylmethyl) propyl] _2_ [(2-quinolyl several yl) amino] - butanediamide; amprenavir (VX-478); DMP-323; DMP-450; AG1343 (nelfinavir); atazanavir (BMS 232,632); tipranavir ; palinavir; TMC-I14; R0033-4649; fosamprenavir (GW433908); P-1946; BMS186, 318; SC-55389a; BILA1096 BS; and U-140690, or combinations thereof. 7. 权利要求1的剂型，其中所述HIV蛋白酶抑制剂是（2S，3S，5S)-5-(N-(N-((N-甲基-N- ((2-异丙基-4-噻唑基）甲基）氨基）羰基）-L-缬氨酰基）氨基-2- (N- ((5-噻唑基）甲氧基_幾基）_氨基）_氨基_1，6-二苯基_3_羟基己烧（利托那韦）。 ((2-isopropyl--4 ((N- methyl -N- - 7. The dosage form of claim 1, wherein said HIV protease inhibitor is (2S, 3S, 5S) -5- (N- (N - thiazolyl) methyl) amino) carbonyl) -L- valyl) amino -2- (N- ((5- thiazolyl) methoxy _ several yl) amino _) _ two amino _1,6- hydroxy cyclohexyl phenyl _3_ burn (ritonavir). 8. 权利要求7的剂型，其中在非禁食状态的狗中，其显示的利托那韦血浆浓度的剂量调节的AUC为至少9 y g. h/ml/100mg。 Wei dose ritonavir plasma concentration adjusted AUC 8. dosage form as claimed in claim 7, wherein in dogs under non- fasting conditions, it displays at least 9 y g. H / ml / 100mg. 9. 权利要求1的剂型，其中所述至少一种HIV蛋白酶抑制剂还包括(2S，3S，5S) -2- (2, 6-二甲基苯氧基乙酰基）氨基-3-羟基-5- [2S- (1-四氢嘧啶-2-酮基）-3_甲基丁酰基]-氨基-1，6-二苯基己烷（洛匹那韦）。 2- (2,6-dimethylphenoxy acetyl) amino-3-hydroxy 9. The dosage form of claim 1, wherein said at least one HIV protease inhibitor further comprises (2S, 3S, 5S) - 5- [2S- (1- tetrahydro-pyrimidin-2-yl) -3_ methylbutanoyl] - amino-1,6-diphenylhexane (lopinavir). 10. 权利要求9的剂型，其中在非禁食状态的狗中，其显示的洛匹那韦血浆浓度的剂量调节的AUC为至少20 y g. h/ml/100mg。 Wei lopinavir plasma concentration dose adjusted AUC 10. dosage form as claimed in claim 9, wherein in dogs under non- fasting conditions, it displays at least 20 y g. H / ml / 100mg. 11. 权利要求1的剂型，其中所述HIV蛋白酶抑制剂是（2S，3S，5S)-5-(N-(N-((N-甲基-N-((2-异丙基-4-噻唑基）甲基）氨基）羰基）-L-缬氨酰基）氨基-2-(N-((5-噻唑基）甲氧基-羰基）-氨基）-氨基-1，6-二苯基-3-羟基己烷（利托那韦）和(2S，3S，5S) -2- (2, 6-二甲基苯氧基乙酰基）氨基-3-羟基-5- [2S- (1-四氢嘧啶-2-酮基）-3_甲基丁酰基]-氨基-1，6-二苯基己烷（洛匹那韦）的组合。 -5- (N- (N 11. The dosage form of claim 1, wherein said HIV protease inhibitor is (2S, 3S, 5S) - ((N- methyl -N - ((2- isopropyl-4 - thiazolyl) methyl) amino) carbonyl) -L- valyl) amino -2- (N - ((5- thiazolyl) methoxy - carbonyl) - amino) - amino-1,6-diphenyl hexane-hydroxy-3- (ritonavir) and (2S, 3S, 5S) -2- (2, 6- dimethylphenoxy acetyl) amino-3-hydroxy-5- [2S- ( l-tetrahydro-pyrimidin-2-yl) -3_ methylbutanoyl] - amino-1,6-diphenylhexane composition (lopinavir) of. 13. 权利要求1的固体剂型，其中所述水溶性聚合物具有80至180°C的Tg。 13. The solid dosage form of claim 1, wherein said water-soluble polymer having a Tg 80 to 180 ° C to. 14. 权利要求1的固体剂型，其中所述水溶性聚合物是N-乙烯基吡咯烷酮的均聚物或共聚物。 14. A solid dosage form as claimed in claim 1, wherein the water soluble polymer is N- vinyl pyrrolidone homopolymer or copolymer. 15. 权利要求1的固体剂型，其中所述水溶性聚合物是N-乙烯基吡咯烷酮和醋酸乙烯酯的共聚物。 15. The solid dosage form of claim 1, wherein said water soluble polymer is a copolymer of N- vinylpyrrolidone and vinyl acetate. 16. 权利要求1的固体剂型，其包含至少一种选自流动调节剂、崩解剂、增量剂和润滑剂的添加剂。 16. A solid dosage form as claimed in claim 1, comprising at least one flow regulators, disintegrants, bulking agents and lubricants selected. 17. 权利要求1的固体剂型，其中在40°C和75%湿度条件下保存6周后其包含HIV蛋白酶抑制剂的起始含量的至少98%。 17. The solid dosage form as claimed in claim 1, wherein after 6 weeks storage at 40 ° C under 75% humidity conditions and which comprises at least 98% of the initial content of HIV protease inhibitors. 18. 制备权利要求1的固体剂型的方法，其包括： i. 制备所述HIV蛋白酶抑制剂、所述水溶性聚合物和所述表面活性剂的均匀熔化物， 和ii. 允许熔化物固化以得到固体分散产品。 18. A method of preparing a solid dosage form as claimed in claim 1, comprising:.. I preparing a homogeneous melt of the HIV protease inhibitor composition, the water-soluble polymer and the surfactant, and ii allowing the melt to solidify to obtain a solid dispersion product. 19. 权利要求18的方法，其还包括研磨所述固体分散产品和将所述固体分散产品压制成片。 19. The method of claim 18, further comprising grinding said solid dispersion product and said solid dispersion product into tablets. 20. 权利要求1的固体剂型在制备用于治疗HIV感染的药物中的应用。 The solid dosage form of a medicament for use in treating HIV infection in claim 20. 21. 固体药物剂型，其包含(2S，3S，5S) -5- (N- (N- ((N-甲基-N- ((2-异丙基-4-噻唑基）甲基）氨基）羰基）-L-缬氨酰基）氨基-2_(N-((5-噻唑基）甲氧基-羰基）-氨基）-氨基-1，6-二苯基-3-羟基己烷（利托那韦）； N-乙烯基吡咯烷酮的均聚物；和脱水山梨醇脂肪酸酯。 21. A solid pharmaceutical dosage form, comprising (2S, 3S, 5S) -5- (N- (N- ((N- methyl -N- ((2- isopropyl-4-thiazolyl) methyl) amino ) carbonyl) -L- valyl) amino -2_ (N - ((5- thiazolyl) methoxy - carbonyl) - amino) - 3-hydroxy-1,6-diphenyl hexane (Lee Torr ritonavir); a homopolymer of N-vinyl pyrrolidone; and a sorbitan fatty acid ester. 22. 权利要求21的固体剂型，其包含至少一种选自流动调节剂、崩解剂、增量剂和润滑剂的添加剂。 22. The solid dosage form as claimed in claim 21, comprising at least one flow regulators, disintegrants, bulking agents and lubricants selected. 23. 固体药物剂型，其包含(2S，3S，5S) -2- (2, 6-二甲基苯氧基乙酰基）氨基-3-羟基-5- [2S- (1-四氢嘧啶-2-酮基）-3_甲基丁酰基]-氨基-1，6-二苯基己烷（洛匹那韦）； N-乙烯基吡咯烷酮的共聚物；和脱水山梨醇脂肪酸酯。 23. A solid pharmaceutical dosage form, comprising (2S, 3S, 5S) -2- (2, 6- dimethylphenoxy acetyl) amino-3-hydroxy -5- [2S- (1- tetrahydro-pyrimidine - 2-keto-yl) -3_ methylbutanoyl] - amino-1,6-diphenylhexane (lopinavir); a copolymer of N-vinyl pyrrolidone; and a sorbitan fatty acid ester. 24. 权利要求23的固体剂型，其包含至少一种选自流动调节剂、崩解剂、增量剂和润滑剂的添加剂。 24. The solid dosage form as claimed in claim 23, comprising at least one flow regulators, disintegrants, bulking agents and lubricants selected. 25. 固体药物剂型，其包含(2S，3S，5S) -5- (N- (N- ((N-甲基-N- ((2-异丙基-4-噻唑基）甲基）氨基）羰基）-L-缬氨酰基）氨基-2- (N- ((5-噻唑基）甲氧基-羰基）-氨基）-氨基-1，6-二苯基-3-羟基己烧（利托那韦）和（2S, 3S, 5S)_2_(2, 6-二甲基苯氧基乙酰基）氨基_3_羟基-5_[2S_(1-四氢嘧啶-2-酮基）-3-甲基丁酰基]-氨基-1,6-二苯基己烷（洛匹那韦）； N-乙烯基吡咯烷酮和醋酸乙烯酯的共聚物；和脱水山梨醇脂肪酸酯。 25. A solid pharmaceutical dosage form, comprising (2S, 3S, 5S) -5- (N- (N- ((N- methyl -N- ((2- isopropyl-4-thiazolyl) methyl) amino ) carbonyl) -L- valyl) amino -2- (N- ((5- thiazolyl) methoxy - carbonyl) - amino) - 3-hydroxy-1,6-diphenyl-hexanoic burn ( ritonavir) and (2S, 3S, 5S) _2_ (2, 6- dimethylphenoxy acetyl) amino _3_ hydroxy -5_ [2S_ (1- tetrahydro-pyrimidin-2-yl) - methylbutanoyl] - amino-1,6-diphenylhexane (lopinavir); a copolymer of N-vinylpyrrolidone and vinyl acetate; and a sorbitan fatty acid ester. 26. 权利要求25的固体剂型，其包含至少一种选自流动调节剂、崩解剂、增量剂和润滑剂的添加剂。 26. The solid dosage form as claimed in claim 25, comprising at least one flow regulators, disintegrants, bulking agents and lubricants selected. 27. 固体药物剂型，其包含占剂型重量5 %至30 %的（2S，3S，5S) -5- (N- (N- ((N-甲基-N- ((2-异丙基-4-噻唑基） 甲基）氨基）羰基）-L_缬氨酰基）氨基-2-(N-((5-噻唑基）甲氧基-羰基）-氨基）-氨基_1，6-二苯基-3-羟基己烧（利托那韦）； 占剂型重量50%至85%的N-乙烯基吡咯烷酮的均聚物；和占剂型重量2%至20%的脱水山梨醇脂肪酸酯。 27. A solid pharmaceutical dosage form, which dosage form comprises from 5 to 30% by weight of (2S, 3S, 5S) -5- (N- (N- ((N- methyl -N- ((2- isopropyl - 4-thiazolyl) methyl) amino) carbonyl) -L_-valyl) amino -2- (N - ((5- thiazolyl) methoxy - carbonyl) - amino) - two amino _1,6- phenyl-3-hydroxyhexanoate burn (ritonavir); of the dosage form 50 to 85% by weight of homopolymers of N- vinylpyrrolidone; of the dosage form, and 2-20% by weight of sorbitan fatty acid esters . 28. 权利要求27的固体剂型，其包含至少一种选自流动调节剂、崩解剂、增量剂和润滑剂的添加剂。 28. The solid dosage form as claimed in claim 27, comprising at least one selected from flow regulators, disintegrants, bulking agents and lubricants. 29. 权利要求28的固体剂型，其中至少一种添加剂的存在量为0%至15%重量。 29. The solid dosage form of claim 28, wherein the at least one additive is present in an amount of 0-15% by weight. 30. 固体药物剂型，其包含占剂型重量5%至30%的（25,35,55)-2-(2,6-二甲基苯氧基乙酰基）氨基-3-羟基-5- [2S- (1-四氢嘧啶-2-酮基）-3-甲基丁酰基]-氨基-1，6-二苯基己烷（洛匹那韦）； 占剂型重量50 %至85%的N-乙烯基吡咯烷酮的共聚物；和占剂型重量2%至20%的脱水山梨醇脂肪酸酯。 30. A solid pharmaceutical dosage form, which dosage form comprises from 5 to 30% by weight of (25,35,55) -2- (2,6-dimethylphenoxy acetyl) amino-3-hydroxy-5- [ 2S- (1- tetrahydro-pyrimidin-2-onyl) -3-methylbutanoyl] - amino-1,6-diphenylhexane (lopinavir); 50% by weight of the dosage form to 85% N- vinylpyrrolidone; of the dosage form, and 2-20% by weight of sorbitan fatty acid esters. 31. 权利要求30的固体剂型，其包含至少一种选自流动调节剂、崩解剂、增量剂和润滑剂的添加剂。 31. The solid dosage form as claimed in claim 30, comprising at least one flow regulators, disintegrants, bulking agents and lubricants selected. 32. 权利要求31的固体剂型，其中至少一种添加剂的存在量为0%至15%重量。 32. The solid dosage form as claimed in claim 31, wherein the at least one additive is present in an amount of 0-15% by weight. 33. 固体药物剂型，其包含占剂型重量5 %至30 %的（2S，3S，5S) -5- (N- (N- ((N-甲基-N- ((2-异丙基-4-噻唑基） 甲基）氨基）羰基）-L_缬氨酰基）氨基-2-(N-((5-噻唑基）甲氧基-羰基）-氨基）-氨基_1，6_二苯基-3-羟基己烧（利托那韦）和（2S, 3S, 5S)-2-(2, 6_二甲基苯氧基乙醜基） 氨基-3-羟基-5-[2S-(1-四氢嘧啶-2-酮基）-3-甲基丁酰基]-氨基-1，6-二苯基己烷(洛匹那韦）； 占剂型重量50 %至85 %的N-乙烯基吡咯烷酮和醋酸乙烯酯的共聚物；和占剂型重量2%至20%的脱水山梨醇脂肪酸酯。 33. A solid pharmaceutical dosage form, which dosage form comprises from 5 to 30% by weight of (2S, 3S, 5S) -5- (N- (N- ((N- methyl -N- ((2- isopropyl - 4-thiazolyl) methyl) amino) carbonyl) -L_-valyl) amino -2- (N - ((5- thiazolyl) methoxy - carbonyl) - amino) - two amino _1,6_ phenyl-3-hydroxyhexanoate burn (ritonavir) and (2S, 3S, 5S) -2- (2, 6_ dimethylphenoxy Chou-yl) amino-3-hydroxy -5- [2S - (1-tetrahydro-pyrimidin-2-onyl) -3-methylbutanoyl] - amino-1,6-diphenylhexane (lopinavir); of the dosage form 50 to 85% by weight of N - copolymers of vinylpyrrolidone and vinyl acetate; of the dosage form, and 2-20% by weight of sorbitan fatty acid esters. 34. 权利要求33的固体剂型，其包含至少一种选自流动调节剂、崩解剂、增量剂和润滑剂的添加剂。 34. The solid dosage form as claimed in claim 33, comprising at least one selected from flow regulators, disintegrants, bulking agents and lubricants. 35. 权利要求34的固体剂型，其中至少一种添加剂的存在量为0%至15%重量。 35. The solid dosage form as claimed in claim 34, wherein the at least one additive is present in an amount of 0-15% by weight. 36. 权利要求21 - 35任一项的固体剂型在制备用于治疗HIV感染的药物中的应用。 The solid dosage form according to any one of the 35 manufacture of a medicament for the treatment of HIV infection in --21 as claimed in claim 36. CL2007002331A1 (en) * 2006-08-10 2008-04-18 Cipla Ltd solid oral composition comprede one or more antiretroviral agents and at least one water-insoluble polymer, in relation about 1: 1 to 1: 6; elaboration process; and use for the treatment of HIV. MXPA04007438A (en) * 2002-02-01 2004-10-11 Pfizer Prod Inc Pharmaceutical compositions of amorphous dispersions of drugs and lipophilic microphase-forming materials.